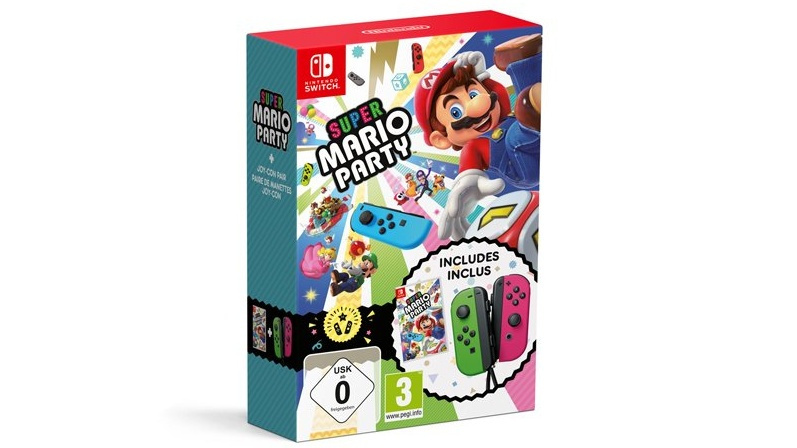 Nintendo has revealed a brand new Joy-Con bundle for Super Mario Party, giving players the chance to stock up on controllers ahead of its chaotic multiplayer launch. This new bundle will include a physical copy of the game and a set of the Neon Green/Neon Pink Joy-Con. Naturally, this is a great option for those looking to pick up a copy of the game and gather some more controllers in the process, and - while the colour scheme doesn't match in the slightest - it's nice to see the non-standard Joy-Con colours up for grabs to add to your collection. As you can see above, it's worth noting that this bundle won't arrive in stores until 23rd November - a good while after the game's 5th October launch date. This one might be best for those waiting until the holiday season for their party gaming fix. As of yet, the bundle has only been confirmed for European fans - we'll have to wait and see if other regions follow suit. In more Super Mario Party news, you can now pre-order the game directly from the Nintendo eShop and will receive double My Nintendo Gold Points when the game is released for doing so. Those points can then be spent towards other Switch games so, if you're definitely wanting a digital copy, a pre-order might be the best way to go. 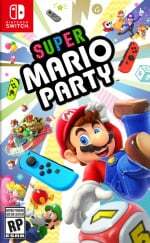 Are you looking forward to Mario's first Party outing on Nintendo Switch? Let us know with a comment. My god, I remember seeing this in a ludicrous rumour. Everyone discredited it, colour me shocked. Gotta hand it to Nintendo. They've already made local console 2-player action more accessible than ever before, but now the same will happen for 4-player. I didn't hear any rumors pertaining to this. Wouldn't it have been a pretty plausible notion to begin with though? Weird that they decided to throw in the Splatoon 2 Joy-Con. Would have been cooler if they brought out new colours to come with the game or at least gone with Neon Red/Blue (inverted from what comes with the Neon Console) which would be more fitting for Mario. Oh well, I'd just be getting the game regardless. Hopefully it turns out well, been too long since we've had a good Mario Party. @Pod I would link the rumour, but I can’t remember where I saw it. The issue with the rumour was that it specified the joycon colour, and everyone thought that if they made joycons for Mario Party, they’d represent the game better. Do I not get credited for informing you on this? So this bundle will be released several weeks after the games’ release date? Also the Splatoon joy cons are a weird choice. Why not just release the japanese exclusive red Mario Odyssey joy cons over here? Is there a Pro Controller's support? I've two pairs of JoyCons, a couple of Pro Cons & don't want to buy more gamepads as my room is already full of all types of controllers. That was my initial thought, too. Would have loved an all green and/or all pink option for my switch. Too bad. It's a bit confusing with a red and blue joycon in the boxart but it comes with green and pink. Weird choice. Hope this Mario party will be good not as the 10th... A 9 on 10 will be welcome from reviews. wait a sec... these are the splatoon joy cons right? 4 was my favourite with the 5th just behind it. @garydbz25 I'll go with Mario party 2 for my favorite. This Super Mario party NEED by obligation to be PERFECT. We're in 2018 on a new console full of potential! Really wish these had their own color, but oh well. Already got the full splatoon Pink and Green sets, so I'll pass. I am very interested in seeing how much Nintendo will be selling this for. I'm guessing that if the bundle comes to Australia, they will most likely charge AU$120, the same as the retail price for the Joy-Con on their own, which is a pretty sweet deal either way. I will most likely skip the bundle as I already have the Joy-Con and have no need of any more. Funnily enough, the Wii Party U bundle was readily available for $59. The Wii remote on its own was $69. @SuperCharlie78 : That was my first thought. Quite a stupid move on Nintendo's part IMO. I had to import the inverted pair from the U.S. I'm not sure how to feel about this until I know the price. Can I color the same color as the Joy-Cons? Why the Splatoon Joy-Con though? Seems a tad odd. @oji I believe the idea is that everyone can use a single Joy-con on it's side to play. So this bundle is for those who only have the two the system comes with, allowing them to now have 4 players. Can't say for sure but it seems highly likely you'll be able to use a Pro Controller or double Joy-Con in a grip instead. Either way if you have 2 sets of Joy-cons already you'll be fine I think. That's how Snipperclips and Overcooked etc work. I will get this digitally because it's a party game that I will be playing quite often. Pretty stoked for this game! I am kinda hoping that they either introduce free or cheap DLC with minigames and maps from older games. Like a few game maps from MP1 and a handful of games from that, Mp2, MP3, etc. Would provide longevity for the game, and a nice call back to many minigames. The colours make sense to me. I'm guessing the audience for Mario Party is more likely to have bought the Switch with the more colourful joy-con (red/blue). Adding pink and green to this looks very playful (each player having their own colour joy-con), which suits well with the spirit of Mario Party, I think. Ugh, just come on with black or dark blue joycons already Nintendo, sheesh. Ah, you mean like, it was thought it'd be more like a Mario+Luigi proper red and green? I do think the colors they have opted to go with fit itn well with the neon blue/red people are likely to already have. Anyone who likes playing Peach in the first place would want the pink. depending on the shipping...I might get this. I want the game and this color combo... so why not... two birds and all. Why no red and blue JoyCons to match Mario's trouser colors? Well this is either interesting and something that may mean I end up buying Mario Party or pointless and unsurprisingly price is the deciding factor. Joy-con pairs are a little too pricey to feel good value but throw in a game for £20 or so extra and the bundle would start to make sense. Over this though and I can't see it wooing many over. I do like the fact its the Splatoon joy-cons. People will already have the red/blue so this adds two new colours to peoples setup. Different colour per player ala N64. Can see how it's incongruous to the Mario theme though. Would be nice if the combo were to be cheaper than the controllers and game separately. Not counting on it though. @Silly_G You think they would charge only $120? I’m guessing a fair bit more but if it’s $120 that’s not bad. I should get these so I have four different colours as I currently have the grey joycons and neon yellow ones. Then again how many joycons can one have? Lol looking forward to Mario Party! @FTL : What else would you suggest? Nintendo would be bonkers to charge $150+ for it. It would still be slightly cheaper than buying the items separately, but a $150 purchase is still a lofty sum for a lot of people and would defeat the purpose of curating a new SKU that offered minimal savings. I'm only going by Nintendo's history with these types of bundles. There could be a markup, but considering how expensive Joy-Con are as is, I can't see Nintendo wanting to put customers off with an excessively expensive SKU. This bundle is targeting Christmas shoppers who want an affordable way to expand their library and enable 4 player multiplayer in addition to their Switch purchase. I also pointed out that the Wii Party U bundle was readily available for $59, that is $10 less than the market value of Wii remotes at the time, so Nintendo must be imposing a pretty hefty markup on their controllers (I imagine that most of their accessories have good margins on them). I was hoping for a blue left joycon. @0muros it's still ND Cube making them, so don't get your hopes too high, they're still the ones behind 9, 10 and of course every Animal Crossing fan's favorite game- Amiibo Festival!! @pika677 I'll buy only if it's excellent like a 9 or a 10/10. Mario party 8,9 and 10 was decent buy not more than that. Average game from a serie of more than a dozen games is not acceptable in 2018. I'd actually buy it myself if the colors were spot on, despite having both splatoon sets. @Silly_G Worth noting the Pokemon bundle is $100 dollars vs the $110 for both game and Poke Ball Plus desperately. So the saving might not be as large as you're expecting. I think I also read somewhere that Nintendo has pretty thin margins on the joy-con to begin with. The console overall has good margins though. Aye that's true, it could certainly be more spot on. The Mario characters aren't neon colored. Nintendo's decision making in terms of colors with Switch seems to have been a scramble from the very begging though, so I'd imagine it was tough to "fix" it now instead of just going with whatever vague semblance of a theme they got going. @Pod It's probably cheaper to reuse the splatoon colors instead of making new ones. Considering the thin margins on the Joy-cons, I kind of get it. It's just a shame, because I would've liked proper sets for Mario(got this one, sort of), Peach, Daisy, and Luigi. How good were the Mario cast themed Wii motes? I got the Zelda Skyward Sword one, and it was a mess. Four different colors of plactic and the A button would get stuck because the glitter coating on top was too thick/uneven. Edit: looked at your question again. If you're referring to the margins, probably a a bit better than with the joycons. Aside from the basic motion controls, a tiny speaker, and simple ir camera, there wasn't much to them. They weren't fitting gyro, ir camera, more Buttons, a joy stick, NFC reader, HD rumble and a proper rechargable battery into a smaller package. I wasn't thinking of profit margins but that's an interesting question. I think you're right that they make less on the JoyCon, but I'm having my doubts about certain factors. Only 50% of JoyCon include IR cameras, and they are smaller, and therefore take fewer materials and are cheaper to transport. These could point to a bigger profit margin. However, JoyCon come with rcharchable batteries, their assembly is rather more complex, and if we were to consider a full controller set for Wii to be a Wiimote and a nunchuck (which is actually still my favorite controller when they work together) then there's no doubt the Wii controllers were a better deal for Nintendo. Neither had a battery, the nunchuck had two digital buttons and a stick only, and no wireless transmitter. And we were charged almost as much for a pair as for a pair of JoyCon. @SuperCharlie78 It sounds like they are just trying to cheaply unload overstock of that green and pink set. @pika677 That doesn't mean Super Mario Party is gonna end up like those games. If you open you eyes, you'll see that they've been listening to fan requests for Mario Party.